Vancouver Magician & Illusionist Yeeri is BC’s Premiere Award Winning Entertainer specializing in Magic for Corporate and Private Events in Vancouver British Columbia. 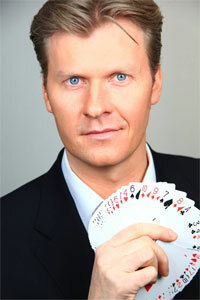 There are lots of Vancouver magicians that you could use at your event so why choose Vancouver magician Yeeri? Glad you asked… Vancouver magician Yeeri is an award-winning magician with over 25 years of experience and an unparalleled celebrity & corporate client list, a list that remains unmatched by other Vancouver magicians. Also, unlike 95% of other Vancouver magicians, Vancouver magician Yeeri is a full time professional and his Vancouver magic programs continue to amaze and astound his high profile clients, people who have “seen it all”. Corporate Leaders, Celebrities, NHL and NBA Stars regularly call upon Yeeri when organizing their special events. Vancouver magician Yeeri has performed for celebrities such as Arnold Schwarzenegger, Sarah McLachlan, Steve Nash, BC Premier Gordon Campbell, Tom Welling, Rock Group 54-40 to name a few. When it comes to corporate Vancouver magic - names such as Ferrari, Maseratti, NHL, NBA, CBC Television, Vancouver Canucks, CTV, Hermes, E-Bay, Royal Bank, CIBC, TD Bank, Johnson & Johnson, are just the tip of the iceberg of Vancouver magician Yeeri’s more than 1100 corporate clients which include many Fortune 500 companies. Vancouver magician Yeeri is also a recipient of the Wilf Rutherford Trophy – a Trophy he had to compete for with other Vancouver magicians and was awarded to him by The Vancouver magic circle (it is a Vancouver magic club that is the largest of it’s kind in Canada) and he is also the winner of the “BC #1 Family Entertainer” award by the BC Parent Magazine. To date no other Vancouver magician or BC magician has won both awards! Whether you are looking for a magician in Vancouver who can perform amazing close up magic as a part of your cocktail hour or a mind blowing after dinner show at your convention or awards dinner, Vancouver magician & illusionist Yeeri is guaranteed to deliver an outstanding entertainment experience! Magic shows at Conventions, Award Dinners, Golf Tournaments, High Profile Fundraisers, Trade Shows, Motion Picture Parties and Corporate Appreciation Events are Yeeri’s specialty. There are a lot of Vancouver magicians that will do a ‘good job’, however if you are serious about taking your entertainment experience to the next level, Yeeri is the Vancouver magician who consistently gets invited to perform for more of the “who’s who” of their industries compared to any other Vancouver magicians. The main reason is simple – word of mouth recommendations! Experience Vancouver magic at it’s best. After all, why hire just any Vancouver Magician when you can engage Vancouver’s Celebrity Magician? For references and testimonials, please click here. For any further questions and information, please contact Vancouver Magician Yeeri at 604-306-6229 or send an email.